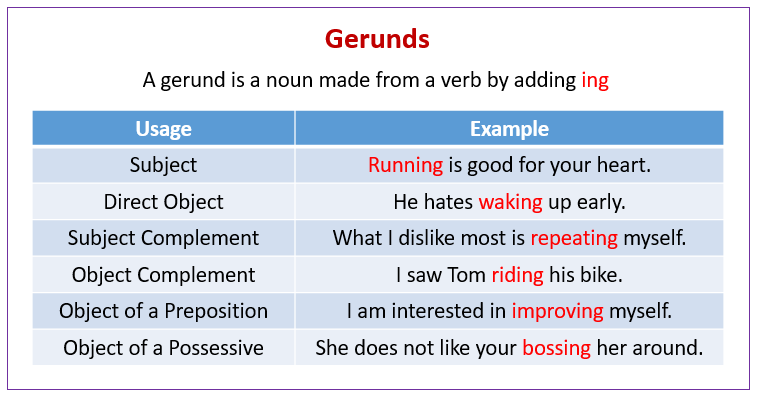 The following diagram describes what are gerunds and how they can be used. Scroll down the page for more examples and explanations of gerunds. A teacher explains what gerunds look like and how they might be used. In this video English lesson, Brian reviews the different ING forms and gerunds. After looking at the various types of ING words in English, Brian goes on to explain the use of gerunds. An English teacher shows some of the differences between the present continuous tense and gerunds.